CINCINNATI -- Experienced renovators Jimmy and Ryan Messer have raced time like never before to get into their 1897 North Avondale mansion by their Aug. 5 deadline. Some 30 craftsmen, led by Indianapolis restoration contractor Billy VantWoud, have scrambled since late May to clear out, strip down, reconfigure, repair and refinish enough of the 12,000-square-foot, 10-bedroom home so that the Messers and their two boys have a home by Thursday. 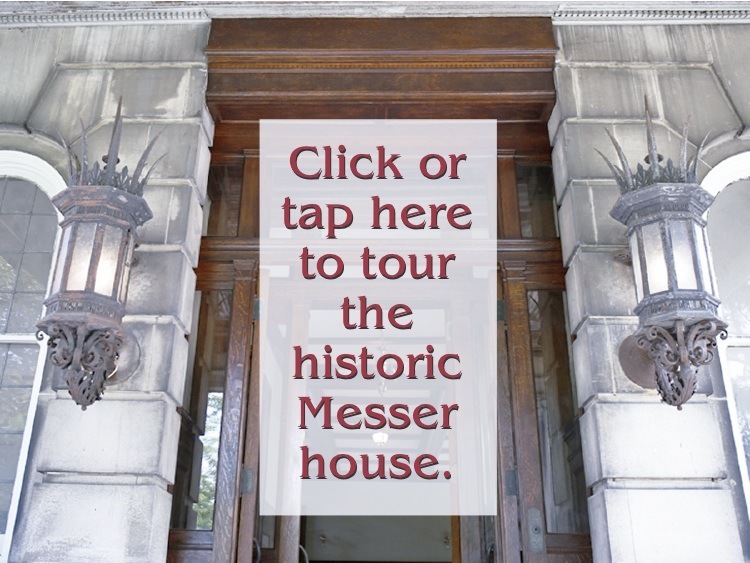 It has been a challenge for them to dodge construction at the Marion and Dakota avenues mansion, which was built for pioneer Cincinnati carriage and motorcar maker Frank Enger, then donated to nearby Xavier University to serve as the Marion Hall dormitory (1943-91). A large portion of the interior work was incomplete the two times we visited in mid-July. The ambitious gardens on the 1.8-acre property, designed by celebrity landscaper Jon Carloftis , have taken shape at lightning speed, and the downstairs living spaces are filling up with furnishings under Jimmy’s direction. It has taken a mini-miracle to get the kitchen to where it can be used to prepare meals. With that in mind, we asked Ryan, a Johnson & Johnson sales director known for his leadership in Over-the-Rhine, where they lived last, and Jimmy, who manages their company, Messuraca Properties , to limit this home tour to five main living spaces on the first floor of their Beaux Arts-Italian Renaissance home. Before taking the tour, some background on one of the stateliest homes in one of Cincinnati's early ritzy suburbs. Frank Enger hired rookie Cincinnati architect Matthew Burton to build him a manor-style home in what was then the country north of Cincinnati. It had to be a comfortable home for his wife and three children as well as a high-end entertainment space fit for his high-society friends. Burton designed what was called Enger Hall and its adjacent 4,500-square-foot carriage house on a bluff and closed it in with an iron fence and gate. The symmetrical facade he designed features brick, limestone and glazed, white terracotta-tile friezes in the Beaux Arts style. Inside, Burton changed wood trim from room-to-room and hired skilled decorators, such as Rookwood Pottery artist John Dee Wareham, to provide panache. A newspaper account of the November 1915 debutante party of Enger’s daughter Ruth hints at how it must have been to be an Enger or an Enger guest. It’s that baronial look with a contemporary twist and heightened livability that the Messers are bringing back to Marion Hall. It will take months, perhaps years, before the renovation ends, but it won’t be long before the massive first floor of the house is filled again with old and new friends and the urban activists the new owners met through their seemingly “always open door” philosophy. Today’s tour focuses specifically on the richly decorated living areas that will become their family room, bar and game room, greeting and music hall, library-office and formal dining room. With his newly toddling son tucked under his arm, Jimmy Messer led us through those rooms, explaining what shape they were in when he and Ryan purchased the house in the spring, what VantWoud and the craftsmen have done to them and what they will look like when they are finished. In Enger’s day (1897-1917), guests would drive their carriages – or perhaps an Enger 40 automobile after it came out in 1911 or a Twin Six in 1916 – up a curved driveway and stop under a port-cochere on the west side of the house. Massive original iron sconces still flank the vestibule opening to the side hall. Through pocket doors to the hall’s left is Enger’s billiards room, a mostly oak-trimmed space with 5-foot-high wainscoting, two portal windows that face the setting sun and a five-window bay on the north end. There is no pool table in this room’s immediate future. It serves as the Messers’ family room, with a sectional sofa, two upholstered chairs in the bay, a large mounted television set and red Chinese toile wallpaper made by Cole & Son throughout. This is where the family will relax and play with their children, which soon will number three with the coming of a daughter, Jimmy said. When the Messers bought the mansion, the room had a drop ceiling and a performance stage set in the bay window that likely replaced a built-in bench sometime during its Xavier dormitory days. There were cracks in the wainscoting, plaster walls and bay window panes, Jimmy said, but the woodwork, including the concentric-patterned oak floor, was in surprisingly good shape considering how many college students had the opportunity to damage it. VantWoud’s crew and subcontractors removed the drop ceiling, installed pocket lights, stripped multiple layers of industrial wax off the concentric-patterned oak floor and refinished it, repaired plaster, fixed and refinished the wainscoting, replaced glass, rewired and added air conditioning (on the first floor only). Enger and his architect brought the decorative Beaux Arts architecture from the facade into the cherry wood room across the side hall from the billiards room. Its 5-foot-tall wainscoting panels have cherry frames filled in with a mock cherry canvas rarely seen today. Shell-shaped and scrolled wood appliques on the door and window trim and star-shaped parquet wood floor squares are French all the way. Jimmy said this room, other than some glued-together parquet pieces that have loosened over the years, was intact and required less intense work than the other first-floor rooms. The floors, which Jimmy said probably were damaged by pet dogs, will have to be taken apart, refinished and reassembled, hopefully within the next few weeks. The room’s fireplace had been removed years before, but the mantel survived. The plaster walls were painted “a horrible blue,” Jimmy said, but are now an antique marble color that complements the cherry trim and wainscoting. This room will be party central for the Messers. Among other furnishings, it will feature a card table with chairs and a traditional contemporary bar Jimmy got for a “great deal” at Williams-Sonoma. Those who come into Marion Hall – the Messers are keeping the name – through its triple-transom, centered, oak front door will be hit immediately with the wow factor its original owner intended them to sense. The hall’s width and depth are impressive in their own right, as are the ceiling’s coffered beams with their carved egg-and-dart and dentil molding. The concentric oak floor required refinishing, and some plaster and woodwork was repaired, but the hall was in good shape when the restoration began. The towering fireplace at the end of the room invites a closer look with its shiny orange tile surround, its wood mantel’s carved Corinthian columns and capitals. The English village painting still hanging above the fireplace reportedly was painted by architect Burton and presented to the Engers. It is the sweeping staircase in the northwest corner of the hall that steals the show, though. Wider than the average Cincinnati mansion staircase at the bottom, its treads increase from 12 inches deep as it curls toward the newel post where they are 18 inches deep. The open staircase rises to a right turn at the landing, then continues to the second-floor hallway that’s trimmed with the original oak balusters. The huge hall will serve as a mingling and sitting space as well as a music room. The baby grand piano the Messers squeezed into their compartmentalized Italianate home in Over-the-Rhine will be the hall’s centerpiece, and there will be a large, Regency-style table in the center and a couple groupings of comfortable chairs for guests to take in the hall’s grandeur. Jimmy said a room-sized area rug he found will pull out the dark reds and golds from the painting, and Chinese table lamps and art books will be among the small decorations in the hall. Enger and Burton chose to feature yet a different kind of wood – mahogany – in the library, which is located through another set of pocket doors directly across the great hall from the French Room. More 5-foot wainscoting, but this time interrupted by built-in, open bookshelves and cabinets, encircles the room. The original mantel above its glossy green-tiled fireplace surround reaches to within a foot of the 12-foot ceiling. Woodwork details revealed during restoration include carved lion’s feet and scrolled appliques. The library, which will serve as Ryan's home office, required a massive effort to meet Jimmy’s expectations and the tight, early-August deadline. The woodwork, he said, was almost black from having multiple layers of shellac applied to it over the decades. It took one craftsman six, 40-hour weeks to chip, strip, clean and refinish the mahogany, he said. The wallpaper of choice for the library was a classic green and blue tartan, but Jimmy said he and Ryan were concerned it was too dark, so they’re painting the once-damaged plaster walls Parish White by Williamsburg. The room will feature a mahogany desk with leather inlay, a Chesterfield sofa, green velvet Louis XVI lounge chairs with tables and at least two taxidermy trophies: a bison head the couple owns and a pheasant Jimmy is hoping to get at auction. Of the five first-floor living spaces, the dining room likely is the one that would shock Frank Enger. His family gathered there when it was an all-oak masterpiece. What might surprise Enger is the floral Shanghai peacock wallpaper on the repaired plaster walls and the Anchor’s Away dark blue paint by Sherwin Williams now coating the wainscoting and cabinetry. The look reflects the bold styling of the Over-the-Rhine home the Messers vacated Aug. 4 – from Jimmy’s collections of large vintage posters and tribal masks to Ryan’s china from Meissen, Germany – that undoubtedly will add spice to the rest of the rooms once they are fully decorated. The Messers hope their efforts bring the same reaction from their guests that they had when they followed North Avondale friends’ advice to check out Marion Hall. They thought it might be too big but changed their minds quickly. That’s how restorer VantWoud feels about Marion Hall, which is the largest project he has tackled since he launched his business in the 1990s. “This was all done to wow … to bring the civility back to the house,” said VantWoud, who has been living temporarily in one of two apartments in the carriage house the Messers intend to renovate and rent. And the work will continue during the Messers’ occupancy of Marion Hall and beyond, VantWoud said.